How to quickly learn how to play guitar chords! Do you want to learn to play guitar, but do not know where to start? Are you afraid that it is difficult? Or maybe after a couple of sessions you have lost confidence in the sucess of learning? This is the solution! Learning to play the guitar from scratch has never been so easy as it is now and the app “120GuitarChords” will prove it to you! It contains all necessary chords to play almost all of your favorite songs. With its versatility, the program has an intuitive user interface and allows you to view the chords not only in the form of charts and tab-view, but also in the form of color photographs. These photos will show you how to take this or that chord. Images of chords can also be dragged and droppped into editable documents, so you can create your own song book with the designation of the chords. Pressing the “play” button allows you to play the selected chord and hear it in its original sound, that is, how it would sound on the guitar. However, you can create a sequence of chords, and write them on a separate partition and create your song repertoire. Not to sing with the voice of “dwarf” or Chaliapin, it is often required to transpose the chords to other keys. This is no easy task, especially for beginner guitarists. 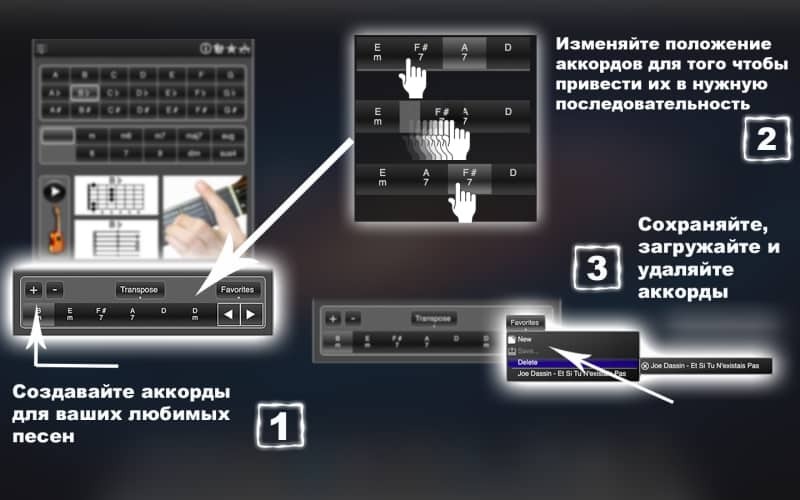 It is solved in this program by pressing the “Transpose” button and selecting lowering or raising the tone. 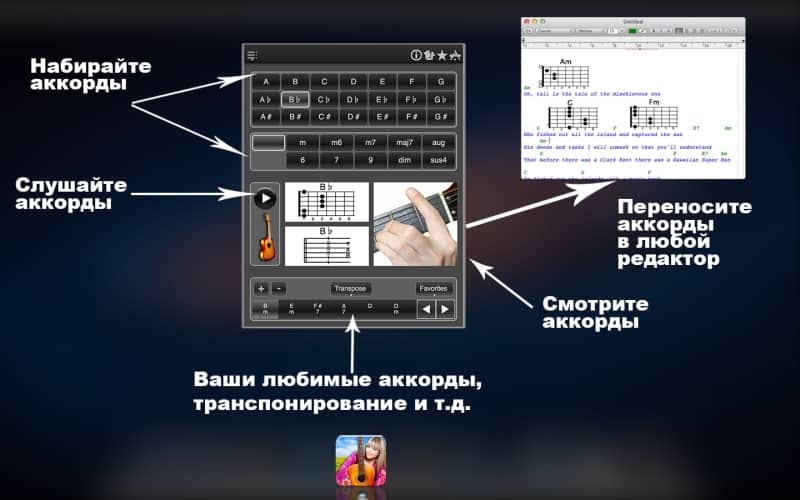 If you belong to those who do not want to rest on the result accomplished, you can also master the musical notation for guitar with the help of another application «GuitarNotesFinder» .